The biggest drop of the week is Warioware: DIY hands down. The whole thing is explained after the break but it's pretty cool. Other than that, we've got Ogre Battle 64 from the N64 on the Virtual Console. Which is also pretty cool. 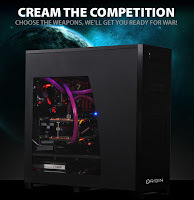 Origin systems, I haven't heard of them but their stuff looks really nice, is first to the table with some badass new PC's that flaunt the newest tech from NVIDIA. Pricing is actually pretty down to Earth too with a single card offering starting at a little over 3 G's. The ORIGIN Genesis desktop will offer NVIDIA GeForce GTX 480 and GTX 470 graphics cards, in single, dual, and 3-way SLI configurations. The NVIDIA® GeForce™ GTX 480 has 1.5GB of GDDR5 memory, and offers two SLI™ connectors for the possibility of three-way SLI. With over 3 billion transistors and featuring 480 CUDA™ cores, the GeForce GTX 480 delivers unprecedented DirectX 11 performance, and support for cutting-edge gaming features including real-time raytracing, 3D Vision Surround, and NVIDIA PhysX™ technology. 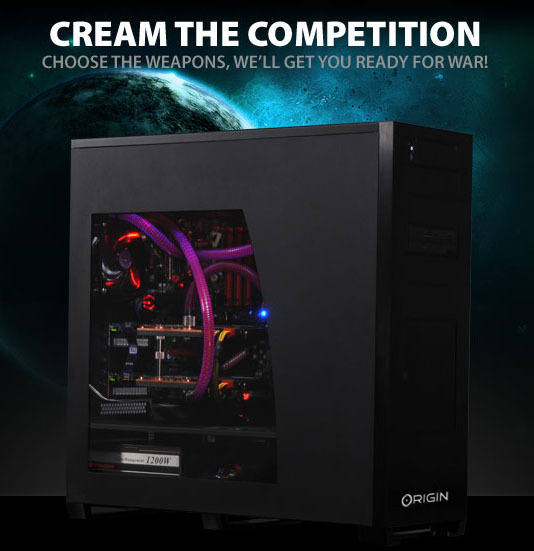 ORIGIN is also offering the latest Intel® Core™ i7 980x Extreme Edition processor overclocked on their Genesis desktop. This six-core processor will run at a stock speed of 3.33GHz, offer triple-channel DDR3 memory controller and the12MB cache supports both Hyper-Threading and Turbo boost technology, which will give gamers the ability to play in a next generation environment. The ORIGIN will not only offer the 3.33GHZ processor as an option but will also offer up an guaranteed overclclocked Core i7 980x up to 4.4GHz. The PSP is 5 years old today! There really hasn't been much to celebrate in PSP land for a while actually. The console is strong in Japan but relatively weak here in the US, running a perennial second to the Nintendo DS. Games (that are any good) have been a rarity as well. If you walk into your local Best Buy, you'll find a bunch of titles that are quite old- Toys R Us barely even carries anything. And to top all of that off, we have the massive flop that is the PSPGo. A nice little system that didn't get any backing and had nothing going for it in the pricing department either since most games on the PSN can be had a lot cheaper at your local Gamestop. Not really something I'd brag about- and I love my PSP by the way. Some of the older games are great- we just need some new ones... thanks God for Metal Gear. Now you can buy a jumbo HD without a new console or hacking anything! I guess this is good news if you buy a lot of movies, install a lot of games, or stick a ton of music on your Hard Drive. I don't do any of those things so I'll just stick with my 120 that came with the Elite. That's really all you have to say about this weeks LIVE releases. Tomorrow, Best Buy will have Modern Warfare branded 1600 points cards available for $17.99. I will be getting one. Then I will be getting this. When PD first came out on the N64 I played it for about five minutes. I was still so wrapped up on Goldeneye that I bought and sold this gem of a game in what must have been about a week and a half. Ever since, I've been kicking myself over never having experienced it in all it's glory. Tomorrow, that will change. I should also mention that Splinter Cell Conviction has a mighty fine demo up for download as well. That's gonna be a good one- there's some nice deals of the week too on original Xbox titles too. There's pretty cool stuff for Dragon Age, Aliens vs Predator, and Need for Speed Shift if anyone's still playing that last one. Also, I might add that there are actual PSOne games in this weeks update! Huzzah!! And it's good stuff too!!! Double Huzzah!!!! Alright, well it might not be good stuff to you. There's a game in this update called 'One'- it's a fairly generic action beat/shoot-em-up that came out a while back. The hook to the game is that there's a 'Rage' meter that fills up and allows for all sorts of nasty attacks. If I remember correctly, One didn't review all that well- but it's a game that I really enjoyed back, as they say, in the day. Give it a shot if you've got some extra cash taking up space in your virtual wallet. Irrational Games has released a few artist renderings of enemies that never made it into either of the Bioshock games. They're pretty grusome looking and really don't scream Bioshock to be honest, so I can easily see why they were cut. Check out the story on Kotaku. Crackdown was written off as a way to play Halo 3 early since it included the multiplayer demo codes in the launch copies. Something interesting happened though- the game actually turned out to be good. Some (me) would even say... great. And that's why it makes me all fizzy with happiness to announce the release date to the amazing looking sequel- Crackdown 2 will be on store shelves on July 6th. First off, we get the excellent Castlevania: Rondo of Blood for the Virtual Console. It's been a while since we got a top shelf title on the VC so I like this very much indeed. I won't be buying the game since I own it on a bajillion (<----- estimate) consoles already, but if you don't have it or have never played it- go get it. If you like old school Castlevania, you'll love this one. The second notable this week is a port of an iPhone game- it's not the first to show up on the DSiWare service, but in my opinion- it might be the most interesting. It's Car Jack Streets. CJS is a GTA-like game in which... Okay, forget that. It basically is GTA. The game was released back before the iPhone had Chinatown wars to some acclaim and with good reason- it's pretty damn fun. If you're pining away for another Grand Theft for the DSi, you could certainly do worse than this little guy. Wow, crappy week for the online services. LIVE had a bunch of lousy old Games on Demand, cartooney racer Scrap Metal, and the Sinclair Solutions pack for Bioshock. Weak week. So first of all, just to remind... The iPad is available for preorder at the Apple store or online @ Apple.com. I was told today by an Apple rep that if you got your order in today, then you have an excellent chance of getting a unit on launch day or within a three day window right after. That should make everyone : ), right? Right. I picked up a 16gig. What'd you get? Quiet week this week for the ol' PSN. There is a bundle of Resident Evil DLC (in case you missed any) and Mega Man 10 if you're jonsin' for some old school 8-bit action, and... no PSOne classics. Again. *Here's the link for the press conference. Not embedding for some reason- sorry everybody. The Move just seems like a re-tread of the Wiimote, complete with a nunchuck like 'sub-controller'. On the plus side, the Move seems to be a bit more advanced than the Wiimote but otherwise is very, very, similar. There will be a stand alone unit offered as well as a bundle pack that includes the PS Eye and a game. The Eye is necessary to use the Move. If you have one already, you're set to go- if you don't, this is the pack for you. There will also be a system pack offered that includes everything mentioned above and, I imagine, will take the place of the sku's on the shelves now. Why sell PS3's without the Move? Makes no sense. Home is getting a couple of new things tomorrow, first and foremost of which is a streamlined interface and speedier loading times. Spring into a new Xbox 360 bundle! This is a pretty awesome deal actually- the new bundle deal from Microsoft contains a 360 Elite (120 gig HD) plus Halo 3: ODST AND Forza 3. I'm really not tryig to sound like a commercial here but that's freakin amazing. Two of the best games from last year and the best 360 on the market for the regular Elite price of $299. Excellent. If you don't have a 360, or if you were thinking about a second one and don't have either of these two games- you might want to consider getting one of these. I have three of the damn things (and both of those games) and I'm still trying to come up with a reason to get it. This week, the Virtual Console takes the stage away from the usual assortment of WiiWare titles as the classic NES title, Final Fantasy II, makes it's debut on the service. Now it should be mentioned that this is not the redux that the iPhone offered but is the original release from lo these many years ago. So if you're looking for a little old time fantasy instead of the gorgeous new game, Final Fantasy XIII, that releases today. When you hear 'Toy Soldiers', do you think of Martika or Sean Astin and Wil Wheaton? Either answer is acceptable by the way. I had a friend who freakin loved the Toy Soldiers movie. Didn't care much for it myself- did like the song though. Hrm. That's slightly embarrassing isn't it? But I digress, all that is neither here nor there as this post is about Toy Soldiers the Xbox LIVE downloadable title. The one that's getting better reviews than either of the above media ever got. Might want to check it out. Not too much to get excited about this week on the PSN. Standouts are the 'Desperate Escape' mission for Resident Evil 5 and the prequel stage for Dante's Inferno. There's also the usual assortment of demo's and add-on's for Little Big Planet. Buy some new cars for Forza 3 and help a good cause. There are almost too many earthquakes to keep track of right now so it might be easy to forget that Haiti is still reeling from the devastating quake from a few weeks back. Forza developer Turn 10 and Microsoft are trying to bring a little help to the people still suffering on the beleagured island nation by offering to donate $10.00 for every VIP car pack that you all buy on LIVE. They'll go up to $100,000- so get crackin'. That's right, she's up and running again. So all you phat owners can boot up and enjoy some Heavy Rain uncomfortable stripping again- or whatever else you might be into. Although this time you actually might win at it considering that it has an 'easy' setting. Not sure how easy that might actually be though. For some folks, that would be those who own PS3 'Phats', the PSN is having a lot of trouble and gaming online is an impossibility. And that's not all. Phat owners are reporting that trophies are disappearing and that some games are even not playable offline as an error message appears. The long and the short of it is that the whole thing might be linked to extensive work being done on the PSN website over the weekend. Which is disturbing on a whole 'nother level. Offline games being affected by online work? Sony is well aware of the issue and is "looking into it". Ugh.